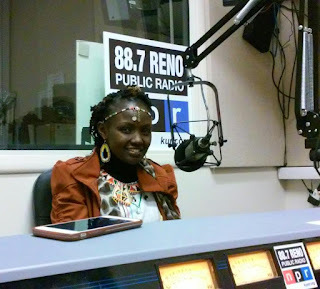 Delegates from more than a dozen countries attended this year's Global Gala, an event hosted by the Northern Nevada International Center Dr. Josephine Kulea was this year's keynote speaker. She is the 2013 UN Kenya Person of the Year, a 2014 Mandela Washington Fellow and the Founder of the Samburu Girls Foundation, an organization that rescues girls from abusive practices in her home country of Kenya. She sat down with Reno Public Radio’s Noah Glick to talk about her work. NG: What is your organization and what kind of work are you doing? JK: "The Samburu Girls Foundation is basically a child rights organization where we protect the rights of girls from harmful cultural practices. And these are child marriages; we have female genital mutilation. So we rescue all these girls and we take them to schools." What's the process like once you find out about these girls who need help? "We get reports from the mothers mostly. It's a whole process to get these girls, because we have to find out where they are located and get together a vehicle to reach them out. We have to go before the day of the wedding, because what happens is the girls are cut, the female genital mutilation is done on the day of their wedding. So when you rescue them from the marriage, you rescue them from both the marriage and from the cut. "It's even risky for us to go on the day of the wedding, so we always prefer to go before, so we avoid the back and forth with families. They are usually angry and they have all these illegal guns and sometimes they try to shoot at us." Do you experience a lot of violent situations? "It starts with a community not understanding that this is illegal, and because it's our culture, they don't feel like it's illegal. So yeah, I get cursed; they do the traditional cursing at me. Of course, they've threatened me. So it's tough, but we have to do it for the sake of these children. I really try to disguise myself, because most of them know my name but they don't know my face." What about the Kenyan government? Have they been supportive? "I think the government did a good job of passing the laws, but that's not enough. But what is lacking is the implementation of the same laws. So you find there's a big gap and I've been to a police station to report a case of a child and they say, 'Oh Madame that is your culture! What is unique about this kid?' So it takes a lot of patience to push them." You mentioned sending these girls to schools. How do you get funding to do these sorts of things? "When I began this work, I was rescuing these girls and paying them with my own salaries. And then it became expensive, so now we have well-wishers who sometimes will sponsor a girl individually. Very few [girls] actually have sponsors, and we'd really like to have more people sponsor a girl to go to school." You actually have a UNR connection. You were here in 2013 for the International Visitor Leadership Program. What was your experience like and what were you able to take with you? "It was amazing, because first of all it was bringing all these leaders from across the globe together, and just coming to America and learning your culture. Also the culture of volunteering is really amazing, because you find so many people volunteering for so many programs here. And I think that's one of the things I learned and went back with it and used it in my project. And it's working. We're now actually opening up for international volunteers. It's really becoming a global village, and that is the meaning of global living: just interact, share and spread the good things, so that it will help us all live together in peace."